Russian Federation President Vladimir Putin addressed an expanded session of the MOD Collegium at the new RVSN training facility in Balashikha on December 22. According to the Kremlin.ru transcript, Putin gave attention to Syria, where he said the Russian Federation Armed Forces displayed “qualitatively developed modern capabilities” to deliver the “decisive contribution” to the defeat of international terrorists. Putin said Russian arms and equipment will be nearly 60 percent modern by the end of 2017, and 70 percent by 2021. Again that word modern. Russia, he declared, will be a world leader in developing a “new generation” army. The Russian leader took pains to accuse the U.S. of violating the 1987 INF Treaty. He indicated Moscow’s priorities in the next GPV will be precision weapons, unmanned strike systems, individual soldier systems, reconnaissance, communications, and EW systems. Not very different from what he said last year. Preserving strategic nuclear parity is a perennial priority. Putin said the Russian triad would be 79 percent modern at end of 2017. By 2021, Russian ground-based ICBMs are supposed to be 90 percent modern. Russia’s president also called for strengthening the SSO and VDV. All in all, there’s less of interest in Putin’s report than Shoygu’s. Shoygu had much to say about Syria as a training ground for the Russian Army and Russian pilots. Some figures were new. Others we’ve heard before. He said 48,000 Russian troops fought in Syria over the last two years. The Aerospace Forces (VKS) flew 34,000 combat missions. The Navy delivered 100 strikes, presumably Kalibr LACMs. Long-Range Aviation flew 66 strike missions. Shoygu reported that 60,318 enemy fighters were killed, including 819 leaders and 2,840 Russian Federation expatriates. The Unified Tactical Level Command and Control System (YeSU TZ) now meets the MOD’s requirements and was used successfully in combat training. Compare this list with 2016. And for reference, with year-enders for 2015 and 2014. Six new Voronezh radar systems and refurbished Daryal, Dnepr, and Volga systems. Much of what’s claimed seems like it happened. Some seems disputable. “More than 1,000 planes and helicopters” seems a stretch. CAST counted 370 fighters and trainers since 2012. Do helos and transports account for the other 630? Other claims are useful starting points but require research. The year-end MOD Collegium fell on December 22. International news agencies headlined what sounded like bellicose braggadocio from President Vladimir Putin. “We are stronger now than any potential aggressor,” he said according to AP. But his remarks were more nuanced than it’s possible to tell from that wire service quote. His full speech to the assembled Russian brass is available here. Putin featured Syria prominently, and indicated that Russia will take advantage of the greater demand for its weapons and equipment because of the war. He listed force development priorities including “precision weapons, modern communications, reconnaissance, command and control, and electronic warfare systems” and strategic non-nuclear forces. He noted that the SAP will be completed “by 2021,” effectively giving the military and industry all of 2020 (not just until the end of 2019) to reach its 70 percent modernization goal. But he also mentioned “five years” to complete rearmament which sounds like 2017, 2018, 2019, 2020, and all of 2021. The dates on the arms program are increasingly elastic as necessary. Not surprisingly, Putin described a higher level of threat on Russia’s borders this year. A complete translation of Putin’s speech follows. After Defense Minister Sergey Shoygu’s lengthy remarks, Putin concluded the session. So Putin wasn’t exactly bragging that Moscow is the biggest bully in the world, but rather claiming that, given Russia’s history and geography as well as its recent military modernization, the Kremlin can now be sure of repulsing any attack on its territory. Assertions about evil U.S. and NATO intentions notwithstanding, what aggressor has designs on Russia today? Putin’s contention is a little abstract, lacking as it does any particular scenario or temporal context. But it isn’t really as sinister as it sounded in Western media. 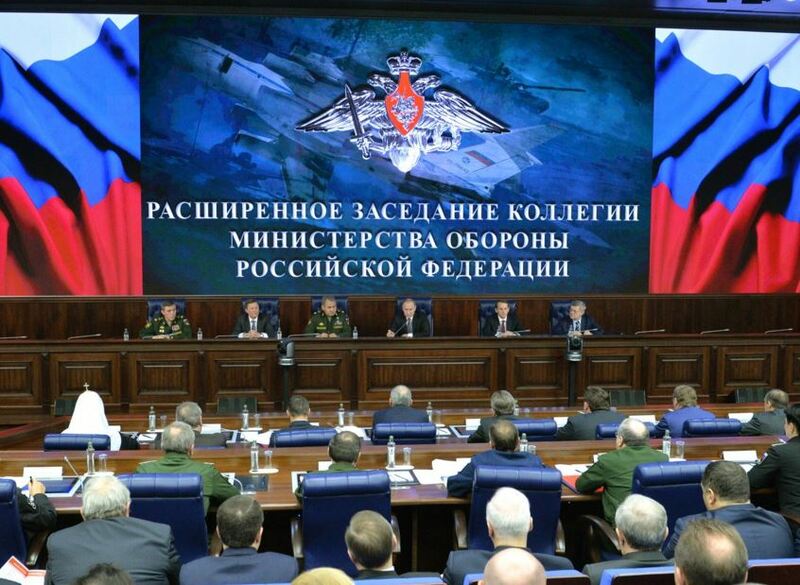 Friday Russian President Vladimir Putin addressed a year-ending expanded meeting of the MOD Collegium. Below are highlights from his speech, and from Defense Minister Sergey Shoygu’s. Putin also met separately with Russia’s Military District (MD) commanders, but no transcript was made available. According to Kremlin.ru, Putin told the Collegium that Russia’s intervention in Syria was prompted not by “incomprehensible abstract geopolitical interests,” nor by the “desire to train [military forces] and test new weapons systems,” although he called the latter “important.” Rather Putin insisted Russian operations in Syria aim to stop the immediate threat ISIL terrorists pose to the Russian Federation. Greater cooperation with allies, the CSTO in particular. Again, he paused to note the need to eliminate shortcomings in territorial defense training in Russia’s regions. Before turning the mic over to Shoygu, the president stated that the MOD has provided permanent or service housing to 146,000 servicemen over the last four years. Russia’s armed forces are manned at 92 percent of their authorized level, including 352,000 contractees (i.e. more than the number of conscripts). Six RS-24 Yars (SS-27 Mod 2) regiments were put into service. The share of modern armaments in the RVSN is 51 percent. Two Tu-160, three Tu-95MS, and five Tu-22M3 bombers were modernized. SSBNs carry 56 percent modern weapons. Overall, Russian strategic forces are 55 percent modern. Eight new brigades of various types were formed in the Ground Troops. The Ground Troops acquired 1,772 tanks and armored vehicles, 148 missile and artillery systems, 2,292 vehicles, and two brigade sets of Iskander-M. Ground Troops’ arms and equipment are 35 percent modern. The VKS acquired 243 aircraft of various types, 90 SAM and 208 radar systems. The VKS are 52 percent modern. The VKS operate 1,720 UAV systems against only 180 in 2011. The Navy received two submarines and eight surface ships. The Navy’s modern equipment constitutes 39 percent of its inventory. The VDV’s modern arms are 41 percent of its total. Overall, the armed forces now have 47 percent modern weapons and other equipment, surpassing the goal of 30 percent by 2015. The in-service rate of equipment is 89 percent. There were nine candidates for every seat in MOD VVUZy this year. Shoygu’s annual report contained many other details summarizing the MOD’s activities this year. Steps to strengthen groupings in the western, south-western, and Arctic strategic directions. Five RVSN missile regiments will go on duty with modern missiles. Two Tu-160 and seven Tu-95MS bombers will be modernized. Two brigade sets each of Iskander-M and Tornado-S MLRS, and one of Buk-3M SAMs will reach the Ground Troops. Six battalions will receive new tanks and BMPs. VKS and Navy will get more than 200 new or modernized aircraft. Five regiments will receive S-400 SAMs. Three Voronezh-DM and Voronezh-M radars will enter service. The Navy will get two submarines and seven surface ships. The armed forces will conduct strategic CSX Kavkaz-2016. The reader may wish to look back to this 2014 year-ender to make some year-on-year comparisons. 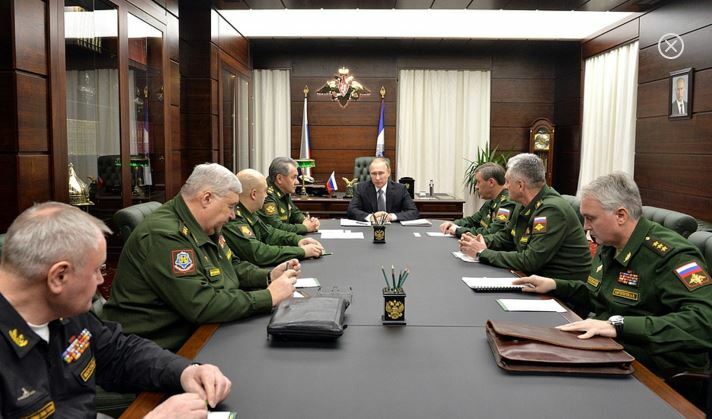 Turning to Putin’s meeting with his top regional commanders, we don’t know what was discussed, but it’s a good pic and a chance to update the lineup and face recce. From the extreme left around the table with Putin in the center, attendees included Unified Strategic Command North Commander Admiral Vladimir Korolev, Southern MD Commander General-Colonel Aleksandr Galkin, Eastern MD Commander General-Colonel Sergey Surovikin, Defense Minister Shoygu, Putin, General Staff Chief Army General Valeriy Gerasimov, Central MD Commander General-Colonel Vladimir Zarudnitskiy, and new Western MD Commander General-Colonel Andrey Kartapolov. November’s the time for year-end evaluations in the Russian military, and the Defense Ministry had its collegium yesterday. Mil.ru printed Defense Minister Serdyukov’s introductory remarks. If that means Rosoboronpostavka, why not just say Rosoboronpostavka? ITAR-TASS actually replaced Serdyukov’s words “Federal Procurement Agency” with Rosoboronpostavka. At the very least, not everyone’s working from the same sheet of music. But continuing with Serdyukov’s remarks . . . Unlike large-scale strategic exercises of recent years, the coming year will stress tactical-level training. But Southern MD exercises will test the new Armed Forces command and control system. 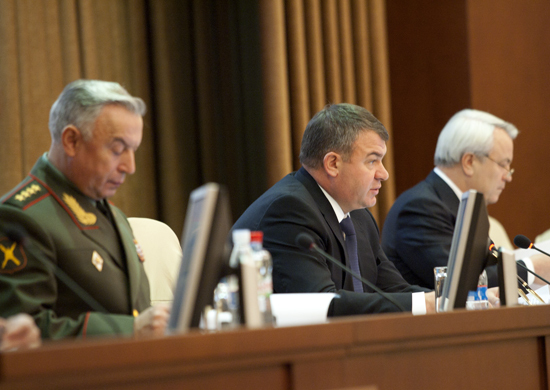 Military police will start working in the troops in 2012, according to Serdyukov. They are still occupied at present with selecting personnel, writing regs, etc. Serdyukov earlier said they’d be functioning in 2011. The Defense Minister indicated all service functions in the Armed Forces will be outsourced next year. Without much fanfare, he said the new system of enlisted contract service will start in 2012. Serdyukov said stimulus pay for officers will continue alongside their newly-approved higher pay. First Deputy Defense Minister, Chief of the General Staff Nikolay Makarov delivered the collegium’s main report, but the press wasn’t invited to stay. Meanwhile, today NG sources “don’t exclude” that Anatoliy Serdyukov could soon leave the Defense Ministry to become Finance Minister. There’s talk Russia’s NATO Permrep Dmitriy Rogozin could succeed him as Defense Minister [because he toured the 58th Army with Medvedev this week]. There are always rumors like these. Recently it was said Makarov would be “sacrificed” as an electoral offering to military men who don’t like him. Sometimes the rumors bear out, sometimes not. More important are the reasons behind any personnel changes. Is Putin or Medvedev likely to find a more effective steward of the military than Serdyukov? Probably not. The fiery politician Rogozin would be a dramatic change from the retiring technocrat Serdyukov. The former would inspire and appeal to the troops more than the latter, but not do a better job. Of course, we shouldn’t assume capability is the leadership’s most important criterion in picking a Defense Minister. In his remarks [text and video], President Dmitriy Medvedev reviewed the results of 2009 and talked about future plans for the armed forces. He focused first on the international situation, noting that, “. . . today we have no requirement to increase further our strategic deterrence potential,” although it remains a determining factor in Russia’s conduct of independent policies and the preservation of its sovereignty. He noted Moscow’s new law authorizing the use of force to protect Russian citizens abroad, and he pointed to unresolved conflicts on Russia’s borders [where presumably the new law could be used]. Medvedev acknowledged some positive tendencies such as work on a new strategic arms control agreement and renewed Russia-NATO contacts. But he called the West’s reaction to Russia’s draft treaty on European security a barometer of relations with the U.S. and NATO. He said it could prevent conflicts like Georgia-South Ossetia. Medvedev asserted that, unfortunately, far from all countries and politicians drew the correct lessons from the August 2008 events. And, unfortunately, he said the reestablishment of Georgia’s military potential continues with external assistance. Then Medvedev turned more to the exact points of his speech. He said the main goal is the qualitative improvement of the armed forces, the creation of a modern army and fleet equipped with the newest weapons. He said last year the organizational base for this was established, as planned, without expending additonal resources. 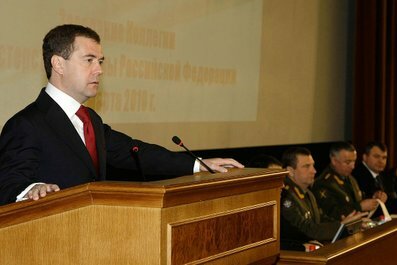 Medvedev called the training of officers the ‘most important task. Motivated, high-class specialists are needed, but the recently degraded military educational system and its material base need improvement. Medvedev said particular attention also needs to go to sergeants. They need to be capable of replacing front-line officers when needed, according to the Supreme CINC. On to rearmament . . .
Medvedev called the task of reequipping the troops with new armaments ‘extremely complex and very important.’ He said last year Russia stabilized the condition of its arms and equipment, despite the financial crisis, and fulfilled the GOZ, although not without problems. He called the contracting mechanism for arms purchases ‘not effective enough,’ and said we are working on this, but it’s slow. This year the State Armaments Program, 2011-2020 will be written. Medvedev gave the government the task of renewing arms and equipment at an average rate of 9-11 percent annually to allow Moscow to reach 70 percent modern armaments by 2020. Reequipping has to be supported by full and timely financing. He referred to his Poslaniye list of priority systems and arms to be acquired. He said this task will not be adjusted, and old weapons need to be decommissioned [He seems to have gotten it into his head that new means good and old bad which is not necessarily the case with Russian weapons. What happens if you scrap lots of stuff, but you don’t succeed in producing new stuff?]. Medvedev said, as he’s already said more than once, steps are needed to bring order to the use, storage, and upkeep of missiles, ammunition, and explosives. The events of the last year have shown there are problems here [alluding to Ulyanovsk, Karabash, etc.]. The President said forces will increase their combat readiness in their new TO&E structures [aren’t they 95 or 98 percent combat ready already?]. The main effort will be forming and training inter-service troop and force groupings, and supporting nuclear deterrence forces. Medvedev said he’ll attend the main, key phases the coming Vostok-2010 operational-strategic exercise. Medvedev obligatorily cited increasing the prestige of military service and improving the social defense of servicemen as a priority task. Medvedev said the government has the clear task to guarantee that all servicemen needing permanent housing have it by the end of this year, and service housing by the end of 2012. Finally, Medvedev spoke for a moment to pay issues. Increasing pay, and instituting a new pay system for active duty troops from the beginning of 2012, and increasing pensions to retired military men [but nothing specific promised]. He said he thinks premium pay or the well-known Order 400 brought respectable results, and it will be important to preserve ways of rewarding servicemen with extra money under the new pay system, and he expects proposals on doing this. Defense Minister Serdyukov had some comments after Medvedev’s speech, but they’ll have to wait until tomorrow.